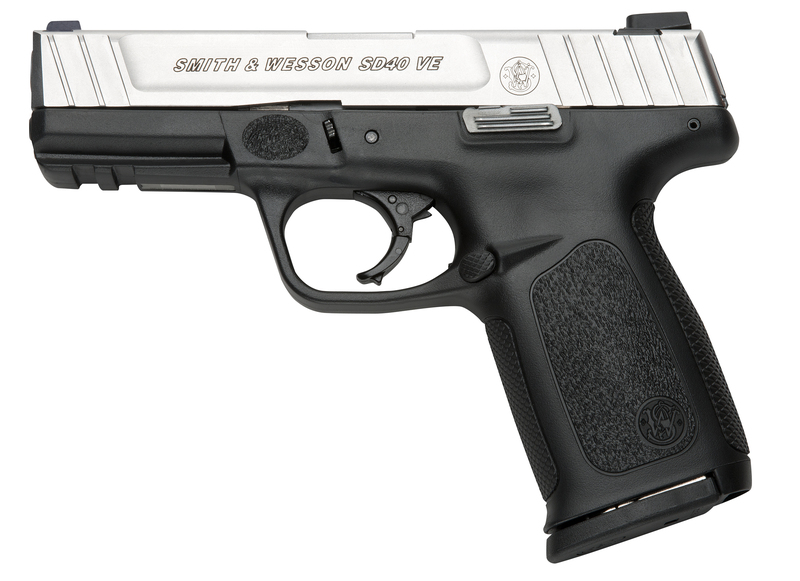 Smith and Wesson SD9VE and SD40VE are value-priced semi-automatic pistols with enhanced features. Designed with the self-defense gun owner in mind, the SD9VE is chambered for the popular 9mm Luger cartridge and the SD40VE uses the .40SW cartridge. The SD9VE and SD40VE feature a polymer receiver, molded for a comfortable, ergonomic grip. The textured frame includes a spot above the trigger guard to rest the trigger finger, reinforcing good shooting habits. These firearms are equipped with Smith and Wesson’s Self Defense Trigger (SDT). The SDT trigger affords a consistent eight pound pull from first round to the last. Standard magazine capacities are 14 for the SD40VE chambered for .40SW and 16 for the SD9VE chambered for 9mm Luger. This firearm features an accessory rail forward of the trigger guard where a shooter can mount a light or laser aiming aid. Made in America, the SD9VE and SD40VE are built to the same exacting standards of all Smith and Wesson firearms.